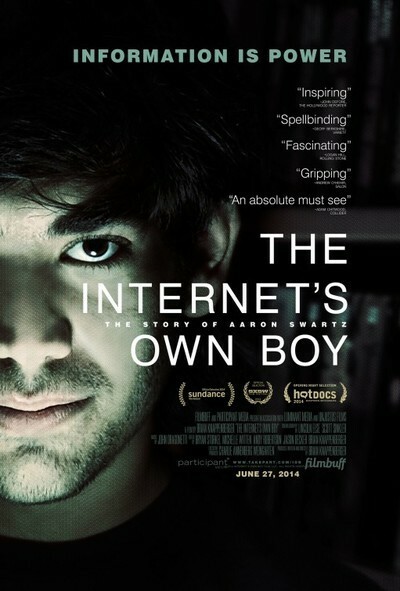 By opening his film with those words, Brian Knappenberger makes crystal clear his belief in the cause of his subject in “The Internet’s Own Boy: The Story of Aaron Swartz.” Swartz was the young man who refused to obey "unjust laws" and he was essentially killed after he chose to transgress them. A government turned trigger-happy by the Wikileaks scandal and a general sense that they could no longer control the dissemination of information in the internet age threatened the technologically pioneering Swartz through over-prosecution, bringing charges that could have landed him in jail for 35 years. Completely shattered at not just the prospect of being labeled a felon for the rest of his life but the betrayal of institutions that should have defended him (like MIT), Swartz committed suicide at the age of 26. The impact of not just his pioneering efforts to make the internet the community and knowledge base it could become but how we could use that for important change has not stopped. One can hear Swartz’s arguments and influence in the fight for net neutrality and calls for access to knowledge to become not a privilege but a right. In that sense, Swartz’s story is one that needs to be told and told and told again until his purpose has its full impact. So it’s forgivable that Knappenberger’s film is one-sided to a fault—anyone who thinks Swartz went too far appears to have turned down requests to interviews and it would have made Aaron’s story stronger to hear from those who defeated him—since that one side continues to change the world. Swartz could have crossed paths with the law at a number of points in his life but it came when he used MIT’s servers to download information and material that he thought should be open to the public and not merely available for the privileged. The government, already openly-criticized by Swartz and others for the way it handled information and privacy, pounced on Swartz. They followed him, they spied on him, and they arrested him, going as far as strip searching a man who had never presented a physical threat to anyone. His world shattered and, even though he would go to continue to be a leader during the investigation, even helping to stop the infamous SOPA from passing, he wouldn’t be the same and he couldn’t face the pain. Aaron Swartz’s story should make you furious. In an era when real criminals of our financial crisis ride limousines to dine with the President, our government overzealously tried to put a man behind bars for decades because he tried to better the world. You can disagree with the way he went about doing it (and I wish the film presented more of the other side against Aaron) but his intent is crystal clear in his presentations and speeches. In many ways, Aaron lived his life online, openly communicating and inspiring others to use technology to unite instead of divide. Get angry at what happened to Aaron and then do something about it. In that sense, his story is far from over.